These products are perfect alternatives for steel or aluminum gratings in corrosive environments, or in places where frequent grating costs and walkway replacement are not good enough (Figure 1). Figure 1. Top: DURADEK® and DURAGRID® fiberglass grating provide safe, corrosion resistant walkways and work platforms in a broad range of markets and industries. 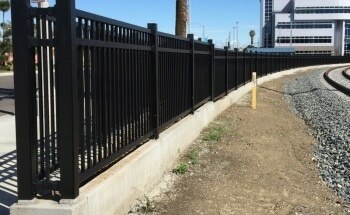 Bottom: Manufactured with unique cross bar construction, DURADEK® and DURAGRID® fiberglass grating can be cut to any size like a solid sheet. DURADEK® is a standard product supplied by distributors nationwide and comes with separate bearing bars in 1" (25 mm) or 1-1/2" (38 mm) I-shapes or a 2" (51 mm) T-shape. It is a flame-retardant product that uses a polyester resin or vinyl ester. DURADEK®’s bearing bars are configured into 12 panel sizes, such as 1 m (standard), 0.914 m, 1.219 m, and 1.524 m widths in each of 6.10 m, 3.66 m, 3.05 m, and 2.44 m lengths. Standard panels with cross-rod spacings of 152 mm or 304 mm on center are also provided. For certain applications, a standard fiberglass grating may not be suitable. DURAGRID® custom grid or grating systems are specifically designed to accommodate such applications. The system offers numerous options such as selection of bar shape, custom fabrication, open space, color, cross-rod placement, or custom resin to the customers. Why Use DURADEK® or DURAGRID® Grating? DURADEK® and DURAGRID® are light in weight, resulting in easy installation and saving of freight cost. DURADEK® and DURAGRID® are fiberglass gratings that are a composite of a thermosetting resin system and fiberglass reinforcements, created by the pultrusion process. This pultrusion manufacturing process is used to produce many unique properties of the product. In addition to a synthetic surfacing veil, the bearing bars have excellent strength and corrosion resistance through the use of longitudinal (glass roving) and multidirectional (glass mat) reinforcements. A thickly packed core in the continuous glass rovings offer strength and stiffness to the bar in the longitudinal direction, and the continuous glass mat offers strength in the transverse direction while eliminating chipping, cracking, and lineal fracturing. The synthetic surfacing veil provides a complete pure resin surface that offers additional corrosion resistance and UV protection. Both DURAGRID® and DURADEK® gratings use the 3-piece cross-rod assembly that forms a strong, unified panel that can be easily cut and fabricated similar to a solid sheet. This specialized system has a pair of continuous, pultruded spacer bars and a center core wedge. To ensure that the bars are chemically bonded and mechanically locked to the web of individual bearing bars, the spacers are nicked at each bearing bar. This approach ensures that the bearing bars are separated and firmly fixed in position and the concentrated loads are distributed to the neighboring bars. Then, the standard carpenters’ tools with abrasive cutting edges can be used to fabricate the ensuing panel. A range of bearing bar shapes, bending bar, and murmurs cross-rod spacings are available based on the design needs. The highest flexibility in design is offered by the standard ‘I” bar, which comes in 1" (25 mm), 1-1/4" (32 mm), and 1-1/2" (38 mm) depths. A more solid walking surface is offered by the unique "T" bar shape, which avoids catching high heels and other similar objects between the bars. This bar is available in 1" (25 mm), 1-1/2" (38 mm), and 2" (51 mm) depths. The Economy series includes a lighter weight bearing bar. Strongwell‘s DURAGRID® Heavy Duty (HD) solid bar grating can take heavy wheel traffic such as forklifts, tow motors, and truck traffic. As different types of wheel types and loadings are available, Strongwell offers heavy duty grating in 1" (25 mm), 1-1/4" (32 mm), 1-1/2" (38 mm), 1-3/4" (44 mm), 2" (51 mm), 2-1/4" (57 mm), and 2-1/2" (64 mm) depths. A 1" (25 mm) "R" bar grating - a rectangular bar - is also available in a number of different series. 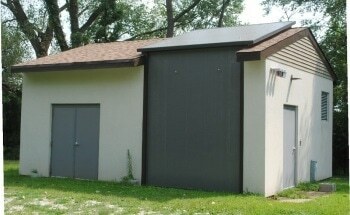 As panels can be designed to accurate sizes, fabrication costs and waste in the field can be prevented. The maximum panel weight is 227 kg, with the maximum panel size of 1524 mm x 6096 mm. Bearing bars can be UV coated for more color stability and protection for outdoor applications. Gratings are available in the two standard colors of yellow and gray, but other colors are also available upon request. A tiny inventory is also preserved for 1" (25 mm) and 1-1/2 (38 mm) "T" and "I" bars in white fire retardant polyester resin. Fire retardant is the usual polyester resin utilized in DURADEK® that meets the needs for a Class 1 flame rating of 25 or less per ASTM E-84 and also meets the self-extinguishing needs of ASTM D-635. The resin also has a UV inhibitor. There is a wide range of resin options such as polyester, phenolic, vinyl ester, modar, etc. available in DURAGRID®. Other options include fire retardant, UV inhibitors, specialized additives, and various colors. Grids with or without an anti-skid grit surface are available on special request. For specific requirements, Strongwell offers a range of grit material and textures. DURADEK® grating was installed on Shell’s offshore platform Ellen (owned by Beta Offshore) in 1979, but the platform has had little to no effect on the 10,000 sq. ft. grating even after three decades of exposure. Figure 2. In 1979, DURADEK® grating was installed on Shell’s offshore platform Ellen. DURAGRID® Phenolic I-6000 38 mm can carry 1.75 times the load of corresponding steel grating when compared to conventional steel gratings. Unlike metal gratings, DURAGRID® Phenolic returns to its original shape when there is excess design load (Figures 3 and 4). Figure 3. DURAGRID® Phenolic grating is used for fire integrity, weight savings and low maintenance and is U.S. Coast Guard approved. Figure 4. Strongwell’s DURAGRID® T-1700 pultruded grating was used for substituting wood planks on a large walkway at Dinner Key Marina in Miami, Florida. The grating allows for easy accessibility to utilities below the walkway and will not rot like the previous wooden walkway. The use of DURADEK® I-6000 38 mm and DURAGRID® T-5000 51 mm with a custom polyester resin are shown in Figures 5 and 6, respectively. Figure 5. Copper processing facilities such as the Ammonia Leach/Solvent Extraction/Electrowinning plant for Minera Escondida Limitada in Chile found DURADEK® I-6000 38 mm to be the perfect solution. Figure 6. Chicago Transit maintenance walkways alongside elevated train tracks constitute one of the largest fiberglass grating installations in history. 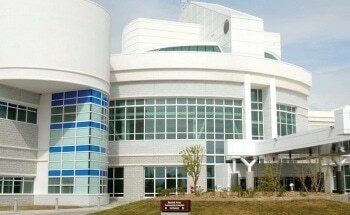 This project used DURAGRID® T-5000 51 mm with a custom polyester resin. The applications of DURADEK® and DURAGRID® fiberglass gratings are shown in Figures 7 to 9. Figure 7. Low maintenance fiberglass grating provides trouble free operations for the covers and walkways in the Lakewood, Colorado Wastewater Treatment Plant Headworks. DURADEK®I-6000 38 mm was used. Figure 8. MIll Ruins Park in downtown Minneapolis, Minnesota utilized DURAGRID® T- 1800 25mm for new pedestrian walkways in the beautiful historical district. Figure 9. Strongwell DURADEK® I-6000 grating was installed at this School of Business and Information Systems in Hong Kong as air-conditioning platforms when placed horizontally and as louver when placed vertically (as shown here). After years of steady beating of golf shoes and continuous moisture, the wooden deck had to be replaced at the Muirfield Village Golf Club as it posed a safety risk. Strongwell developed DURAGRID® T-1800 utilizing a customized pigmented resin to replace the wooden deck and provided the aesthetic and structural benefits required by the club (Figure 10). Figure 10. The Muirfield Village Golf Club, designed by Jack Nicklaus, offers an outside patio deck for players to relax and have a snack between nines. A 51 mm-deep nosing is joined to the leading edge to produce stair landings and treads. This provides additional strength and rigidity to the area that takes the maximum impact and abuse. The nosing is designed to provide an increased surface area for skid resistance, wear, and better visibility. Gray stair treads with yellow nosing are also provided, at an additional cost. Fiberglass Curb Angle provides a strong and firm base for bearing bars. Just like other DURAGRID® and DURADEK® products, Fiberglass Curb Angle is pultruded from the same material in the same way. Corrosion-resistant Fiberglass Curb Angles are available in four sizes in gray fire retardant vinyl ester. A range of fiberglass flooring and decking materials are provided by Strongwell. A brief description of other flooring products available in the Strongwell industrial product line is shown in Figures 11 to 15. Figure 11. SAFPLANK®, a system of interlocking planks, provides easy installation and superior corrosion resistance for applications requiring a solid deck or floor. Figure 12. SAFDECK® is a high strength, one-piece, overlapping panel system. Low in conductivity and nonsparking, SAFDECK® provides safe walkways in numerous applications. Figure 13. DURAGRATE® molded grating has a concave profile on the upper surface for skid resistance. Grit tops are optional. Figure 14. COMPOSOLITE® building panels are suitable for major load bearing structural applications and are particularly well-suited to outdoor use and corrosive environments. Figure 15. SAFPLATE®, a solid anti-skid flooring, helps reduce worker slips and falls in both wet and dry applications.